Panasonic has revealed a cluster of upgrades for its Toughbook 31 device. The newly enhanced version of the fully ruggedized notebook will now come with an Intel Core i5-7300U and 16 GB RAM as standard, and it will also feature improved communication equipment and a second battery option. The device will be available in the US in December, at a price starting from around US$3,699. A press release from Panasonic has unveiled all the new bells and whistles the Toughbook 31 will be receiving. The specialist device from the Japanese manufacturer has been considerably upgraded, to help the series maintain an edge over the competition to attract buyers from the outdoor working sector. The enhanced version of the Toughbook 31 device will be powered by a Core i5-7300U, which according to Panasonic will offer a processing performance boost of 19% and graphics performance boost of 42% over the previous used base model chip, the i5-5300U. 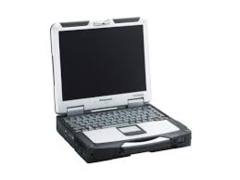 Panasonic has been quite thorough with its upgrade of the Toughbook 31. Base amount of RAM has risen from 4 GB to 16 GB (DDR4), with the option to expand to 32 GB. Storage will be provided by a 256 GB SSD (no more HDD in the MIL-STD-810G certified device) and the press release even mentions the use of a second battery to assist with battery life extension – always a boon for outdoor workers who may be miles from the nearest socket. Communication has also been improved with the new version of the Toughbook 31. Panasonic has upgraded the Wi-Fi chip in the device and an EM7455 LTE-Advanced module is optionally available for those who want fast LTE speeds while on the go. It seems the upgraded laptop will be highly customizable, making it attractive to potential specialist users who may require a specific component included in their fully ruggedized devices. Panasonic expects this variant of the Toughbook to be available for the US market in December, with street prices falling at around US$3,699.